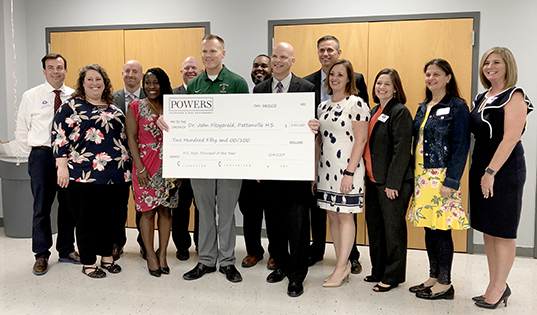 Pattonville High School assistant principal Dr. Jon Fitzgerald was selected as 2019 High School Assistant Principal of the Year by the St. Louis Association of Secondary School Principals (SASSP). On April 11, he was surprised with the news of his recognition and a check for $250 to use to award a scholarship to a Pattonville senior. SASSP is a district within the Missouri Association of Secondary School Principals (MoASSP) and covers about 70 school districts and private schools throughout the St. Louis metro area. Each MoASSP district selects one individual to be recognized as High School Assistant Principal of the Year at the annual fall conference. One of those individuals will be selected as the MoASSP Assistant Principal of the Year and will be entered in the national Assistant Principal of the Year award program. MoASSP's awards program recognizes exemplary performance among secondary school principals who have succeeded in providing high-quality learning opportunities for students. Dr. Jon Fitzgerald, center left, is shown with representatives from the St. Louis Association of Secondary School Principals who surprised them with the news of his recognition.